Episode 17: "A Hamlet in Flames"
In 1940, German Colonel Kurt Schmidt calls on the Marquis Francois Remy demands to be allowed to purchase a first folio of Shakespeare's Hamlet for a small fraction of its true value of $200,000. Forcing the Marquis to sign a bill of sale dated 1937 in order to save himself from execution, he agrees, asking the colonel if he is sure he wants to use that date for the sale. After the Marquis leaves, Colonel Schmidt signs the order for the immediate execution of the Marquis. 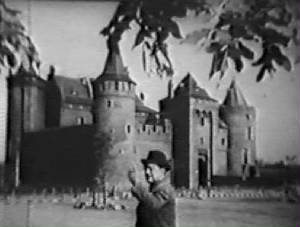 In 1957, Charlie Chan and Number One Son, Barry are in Germany visiting the castle of Baron Schmidt. The Baron is currently involved in a business transaction involving his agent, Rudolph Zeigler, and Conrad Weiss, regarding the proposed sale of the Hamlet folio for $250,000. Before they leave, Schmidt asks and is assured that the folio is fully insured. As Zeigler and Weiss leave, Schmidt greets Chan and Barry. Chan informs the Baron that he the purpose of his visit is to allow Barry to photograph Schmidt's rare Hamlet folio page by page to present to his college library. Schmidt agrees, offering to meet with Barry the next day at Rudolph Zeigler's book shop. That night, Pierre Lebeck inquires about the Hamlet folio at Zeigler's shop. Conrad Weiss tells him that he will need to speak with Zeigler in the morning. Reentering the shop, Weiss surprises and fends off a thief. Chan and Barry’s fortuitous arrival sends the thief running, and as Barry tries to stop him, he is overcome. The next morning, Chan and Barry visit Inspector Steiner. Barry states that something about the burglar reminded him of Baron Schmidt. Barry suggests that Schmidt may have been trying to steal the folio in order to collect on the insurance, and that the Baron and Pierre Lebec may have been working together. At the Baron's castle, Arthur Fitzroy of the Shakespeare Historical Society in England inquires about the rare Hamlet folio, knowing that it had once belonged to Francois Remy, showing surprise that it was sold in 1937. Fitzroy, asking for proof of the sale, the Baron produces the bill of sale bearing the date "11th July, 1937" as well as the selling price of $100. Later, Chan and Barry meet Baron Schmidt at Zeigler's book store to take a look at the folio and to arrange for a time to take photographs. Chan announces that, while Barry will return that evening to photograph the folio, he will be visiting Inspector Steiner. Before leaving, Schmidt asks that Arthur Fitzroy not be allowed near the folio, as he does not trust him. That night, at a restaurant, Lebec and Fitzroy discuss the folio. Lebec insists that the Baron’s bill of sale must be a forgery as Francoise Remy did not even own the Hamlet folio until later. At the book store, Barry Chan takes is at work photographing the pages of the folio. Answering the telephone, Barry is informed that his father has suddenly become seriously ill at police headquarters, and he immediately departs. Arriving at police headquarters, a shocked Barry finds that his father is perfectly fine. Realizing the purpose of the ruse, Chan, Inspector Steiner, and Barry hurry off to Steiner’s book store. On arrival, they discover a fire in the shop and next to it Schmidt's lifeless body. In the morning, back at the shop, an angry Zeigler blames Barry for the loss of the folio in the fire. Speaking with Chan and Inspector Streiner, Zeigler is told by the detective that the fire was the work of arsonist. Zeigler suggests that Barry may at least be partly to blame for the crime as he may have left the shop's door unlocked when he hurried out. Barry asserts his idea that Schmidt was possibly in that act of stealing the folio and then died as a result of the fire he started to cover his tracks. Zeigler, denounces the notion that Schmidt could have somehow been involved. Instead he notes his suspicion of the Frenchman Lebec. Steiner informs Chan that the autopsy report indicates that Schmidt was shot dead before the fire started. At a local restaurant with Inspector Steiner and Barry, Chan receives a report from Paris that Lebec is a war hero, Lebec was an underground specialist in arson. Chan adds that this could have a connection with Baron Schmidt's service in the Nazi SS, requesting Inspector Steiner to obtain the Baron’s war record. Fitzroy, who was sitting in at a nearby booth, leaves after overhearing the conversation. At police headquarters, as Chan reads through the short report of Schmidt's work in occupied Belgium during the war, Barry arrives to inform him, to no surprise to his father, that the folio destroyed in the fire was a fake. Following a secretive phone call, Chan meets with Pierre Lebeck. He reveals his knowledge that Lebeck, Marquis Remy, and Fitzroy worked together for the French Resistance during the war. Lebeck tells Chan of how he and Fitzroy had been searching for Schmidt since the end of the war for the murder of Remy. When the Hamlet folio, which had belonged to their friend, was put up for sale, they had their first concrete clue. Lebeck also tells Chan that he and Fitzroy had nothing to do with the death of Schmidt. Chan sends Barry, who has intruded on the scene, to have Inspector Steiner take the two men into custody, telling them that if they are truly innocent, they will have nothing to fear. Back at the book store, Chan meets with Zeigler and Weiss as Inspector Steiner arrives with Lebec and Fitzroy in tow. Seeing them, Weiss identifies Lebec as the one who was present during the first robbery attempt at the book store. Chan informs Weiss and Zeigler of the fact that Lebec and Fitzroy have committed no crime. The solution to the murder of Schmidt, Chan tells all present, lies in the false telephone call made that took Barry from the book store. Whoever made that call had to know of Chan's presence at police headquarters. Besides Barry, only two persons were aware of this fact: Baron Schmidt and one other person…Conrad Weiss. A search of Weiss' house has turned up the missing Hamlet folio. It was he who made the phone call to Barry, and it was he who set the shop on fire and killed Baron Schmidt. Weiss tells of his great love for rare books, and, knowing that it was Schmidt who had tried to steal it earlier, kept that fact a secret, planning to take the Hamlet for himself. Weiss had set the fire in the shop to cover his own theft, and when Schmidt unexpectedly arrived in a second attempt to steal the folio, Weiss pulled a gun and accidentally shot Schmidt. Later, Chan learns that Weiss will not stand trial because he has had a debilitating heart attack and is near death. Charlie Chan (to Barry): "Ex Chinese policeman not born yesterday." Impatience is a disease of the young; can only be cured by old age. Like retired fire horse who smell smoke, I cannot resist lure of police headquarters. In all cases, one must consider even remote possibility. Like lady using make-up, takes on different face. In every detective's life there are moments that are very painfully distasteful.